Welcome to Day #4 of Chocolate and Seeds Theme Week. Today's Peanut and Dark Chocolate with Chia bar from Mamma Chia (Carlsbad, CA) had a sweet, chewy, nutty and seedy texture—and a dark chocolate base and icing. 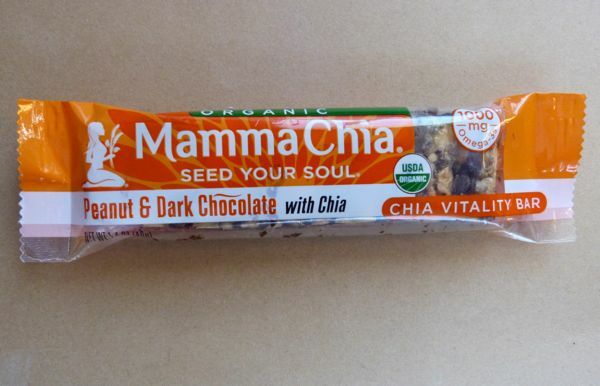 You could say this was a snack bar with a mission—one of a line of Mamma Chia beverages and bars with organic chia seeds. The company promotes the "Magic of Chia," i.e., its Omega-3s, dietary fiber and complete protein. 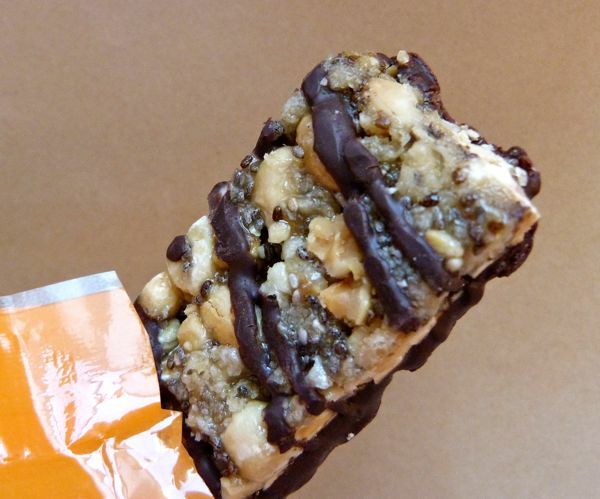 "BPA-free, Non-GMO, Gluten Free and Kosher," this hearty yet light bar contained a healthy dose of Omega fatty acids: Omega-3: 1,000 mg; Omega-6: 300 mg; Omega-9: 4,800 mg; and protein (6 grams). The team at Mamma Chia also participates in 1% for the Planet program(s), and the company was a founding member of the Slow Money organization. Like other seeds highlighted in this Chocolate and Seed week, chia seeds (from Salvia hispanica—a plant in the mint family) originated in the Americas. More specifically, chia is native to Central and Southern Mexico and Guatemala, and was eaten by the Aztecs and Maya people. Sunflower seeds, pine nuts (seeds), chia seeds, squash and pumpkin seeds, and other seeds, were all eaten by native peoples in the Americas before European settlers arrived. As I pondered yesterday (with sunflower seeds), might chia seeds have been combined with cacao seeds (beans) or drinking chocolate a thousand years ago? Another research project to be added to the list. *Pine nuts (or seeds from pine cones) came/come from pine (or pinon/pinyon) trees from at least three continents. Popular source trees include the Italian Stone Pine, the Mexican Pine and Colorado Pine, and Siberian Pine.